You’ll be forgiven for not already having booked your holiday home or hotel reservation, for the 33rd edition of the America’s Cup, to be held on February 8-12. As of today, the very staging of the event is still up in the air. “Your sails were made in the US! Not Switzerland!” Seriously, that’s the gist of the current reason for postponing the most important event in sailing. But should the race actually occur, you’ll be able to watch it live and for free on the official site, americascup.com. For the first time ever, the race will be broadcast live, in its entirety, on the web. 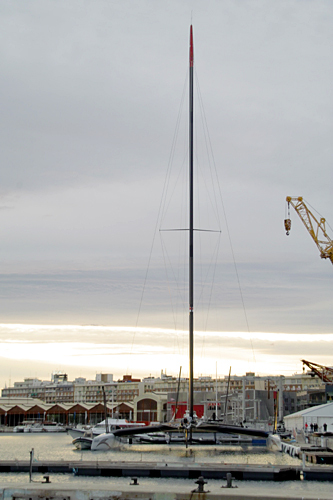 We saw Alinghi’s boat in the harbor recently, and it is truly massive. Word is that Oracle’s is even more insane. So, even though the race features just the two teams, the scale of their boats and the boiling animosity between them almost guarantees excitement.